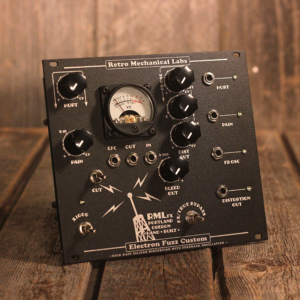 We have transformed the Electron Fuzz Custom into 100% full eurorack format. This is the full production run. Laser cut aluminum panel. Built by organic free range Portlanders. Lots of videos on Instagram. Click here to browse my personal RML account. The eurorack module is essentially the same as the “EFCcv euro” pedal with a couple of slight modifications. I’ve added the GPI (Guitar Pedal Interface) input attenuation. This lets you bump the input down even lower levels to compensate for the hotter eurorack line levels. It also give you the ability to still use it with guitars and standard line level instruments such as external drum machines and synths like with the original guitar pedal. You can literally patch a guitar right in using the proper 1/4″ to 1/8″ cable. Taking full advantage of the higher voltages available I was able boost the final output of the pedal to full eurorack levels. 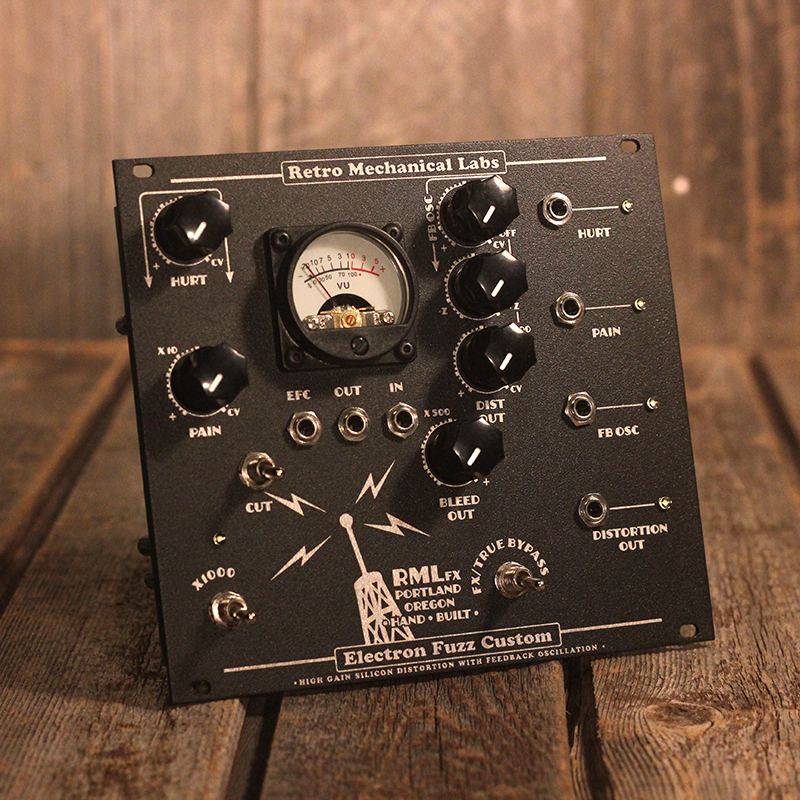 The “Bleed” (Clean Mix) is now independent of the distortion GPI attenuation. So mix that awesome hi-fidelity signal in with your distortion, or turn it completely off. Its up to you! I’ve included the original “EFC” output. 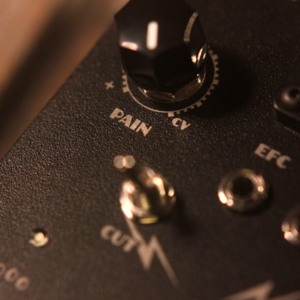 This is a direct tap of the pre-eurorack EFC guitar pedal. The output is muted when in bypass. The output is lower (like the original pedal) and before the final op amp gain staging. Feel free to plug an output signal in and see what happens. Its an “in” AND an “out”. IMPORTANT: This is a high gain distortion. It will boost any line noise you feed into it. This is most apparent when the x1000 toggle is engaged. You may think your system is quite until you crank that gain up! It will not insert noise into your system, only amplify noise that is already there. This is a byproduct of distortion pedals and is not something I can filter out without affecting the sound. If you have it plugged in and NOT in bypass mode you will hear your systems line noise. This might be an non-issue since its not noticeable while sound is running through it. Naturally when not using it and nothing is plugged into it you wont hear anything. I just like to remind people there are consequences to your actions. Artificially boosting your gain this much sounds great but is not without its artifacts. It has true bypass just like the guitar pedal. Yeah thats crazy but I left that on for performances. Just like on the standard pedals there can be potentiometer wiper noise. Most apparent when no sound is running though the pedal. •••Eurorack module while still a guitar pedal. 4 CV inputs work on a positive +5 voltage. Safe to run higher voltages in but you wont notice much change past 5volts. “Hurt“, “Pain“, “Feedback OSC“, and “Distortion Out” all have independent CV controls. “Hurt” works as a Hi-Pass. “Pain” works as a low pass. Both of these tone controls are tied to gain stages. Changing these also affect the amount of gain passing to the next gain stage. This produces a more chaotic form of tone control and a wide range of textures. “Feedback OSC” is a noise making function that can produce sounds ranging from low pulses or bit crunch to tunable wha-screaming self oscillation. The tone of the Feedback OSC is greatly dependent on Hurt and Pain controls. “Distortion Out” is the volume of the distortion pedal. It works like a basic VCA. The Distortion Out is independent from the “Bleed Out” that functions as a clean pass circuit. 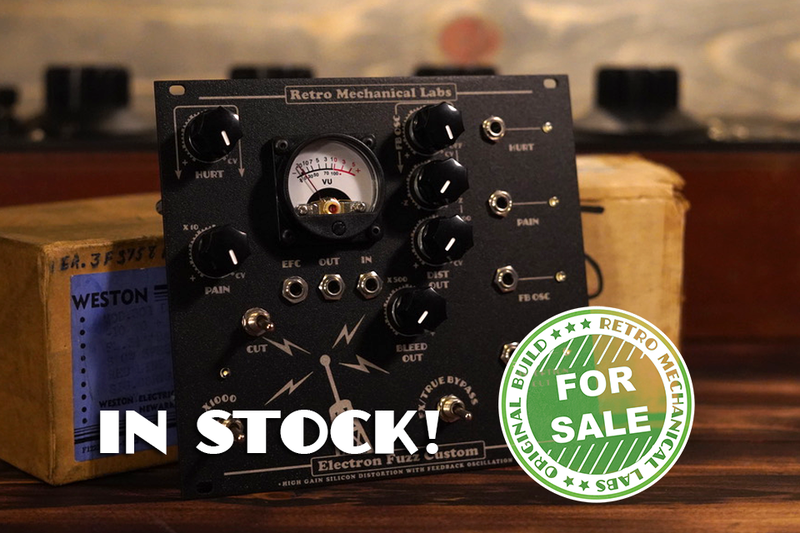 Ideal for mixing distortion with synths or anything from vocals to drum sounds. 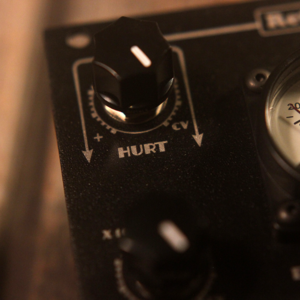 The new input impedance knob: reduces the amount of signal hitting the distortion circuit. Concept: The clean signal pass provides a way to keep the fidelity of the original signal intact while mixing the distorted signal over it. 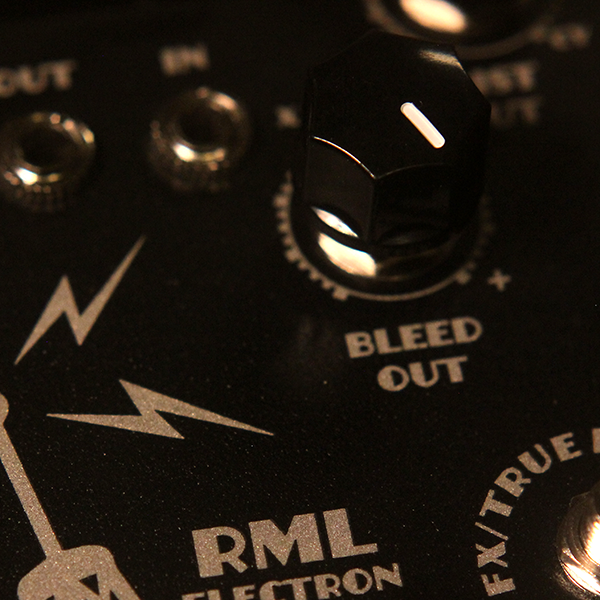 Function: ***This is a high gain distortion pedal. Please expect it to behave as such. In short it will amplify line noise. Moog products tend to be very clean. Dave Smith synths such as the Pro2 tend to have a higher noise floors. While no signal is being run through it the noise floor will be amplified. If a square wave CV signal is left on you may hear “CV tick” as the transistors switch from open to closed. Here is a great demo video of the non-cv EFC from the “Pedal and Effects” youtube channel featuring Alessandro Cortini of NIN, Sonoio and Modwheelmood. The red LED switches on when boost mode is enabled. A convent way to know where you are when playing. FB Noise: Adjusts the amount of feedback in the circuit for noise making. Creates a weird octave mod fx.